After the long struggle and wait of Pastafarians in making their church official, the Church of Flying Spaghetti has now been acknowledged and officiated as a legal denomination. This comes to the followers as great news since they have fought from 2005 to make the church an official entity. 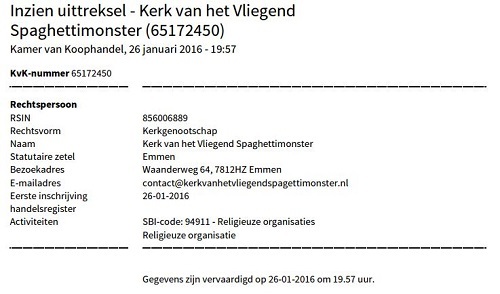 The news came from the Dutch Branch of Flying Spaghetti in their official website. It clearly stated that the Netherlands’ Chamber of Commerce has finally acknowledged the church as an official denomination. This was the first country in the world to do such. The followers of this church took to the streets to celebrate the long awaited victory. As a way of communicating to the world that they have won, followers wore bowls of pasta on their heads. This they did to show the world that they are unique in their way of operation. To some extent, The Church of Flying Spaghetti is not seen as a religion per se and that is why it was labeled a denomination. It is more like a movement that advocates for peace and good co-existence among people. However, the torchbearers of the group are for the idea of light-heartedness in viewing matters of religion dogma. Among the things that they are against is the creationism and intelligent designs in public schools. Just after the news of officiating the denomination, the spokesman of the movement confirmed that their stand has not changed at all. He confirmed that their mission is to uphold and preach equality among all. He further said that any person who feels like joining the denomination should do so at their own will and be obligated to nothing but the mission of the church. The faith of the followers of Flying Spaghetti Church is more on the lighter side of life. Members are always free to meet and drink beer and take pasta while still discussing matters of faith. Above all, members are allowed to socialize with the rest of the world and make clear the mission of the church. The church has over 4,800 followers on Twitter. The torchbearers of the church have already expressed gratitude with those who have shown trust in the church and followed it on social media. “There is great hope for the denomination,” they said.